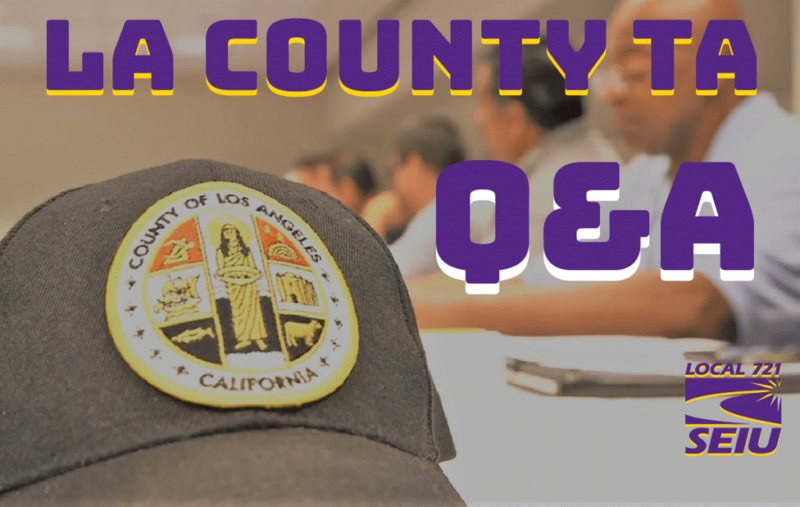 LA County TA – forget the rumors, get the facts! NOTE: The last update to this web page took place on Tues., Oct. 2 at 9 A.M. Questions subsequently arose in the Comments section below – and you can read all the answers by clicking here. Question #1: Is contract bargaining over? Answer #1: No. We have reached agreement on Common Language and Fringe Benefit issues covering general salaries, health benefits and many other basic issues. In addition, most Bargaining Units have reached final agreement on all issues. But there are still some Bargaining Units that have not yet reached final agreement and they will continue to negotiate this week. Question #2: How long will our contract bargaining agreement last? Answer #2: It will last for three years – from October of 2018 through September of 2021. Question #3: What are the terms of the contract? Answer #3: General movement is a salary increase of 10.75% plus a one-time bonus of $1,000. Question #4: Are there other salary increases? Answer #4: Over 32,000 members – including the vast majority of our lowest-paid members – will receive a salary increase of at least 12.25% plus a one-time bonus of $1,000. Also, additional “inequity” salary increases for most classifications are scheduled at various dates (depending on classification). Question #5: Is everyone receiving a salary increase? Answer #5: Yes. In fact, the average increase is 11.7% and everyone will receive a one-time bonus of $1,000. Question #6: What is the salary schedule for this increase? Answer #6: The basic schedule of the salary increase – which pertains only to all permanent, full-time employees except for members of BU 311 and 312 since they are still bargaining – is as follows. Temporary and/or part-time employees will have a slightly different salary increase schedule. Your individual Bargaining Unit will have details. Question #7: Is it true we lost our Flex Earnings? Answer #7: NO. Do not believe the rumors! We did not lose our Flex Earnings. Flex Earnings have been adjusted. Flex Earnings will be capped at a maximum of $325 per month in 2020 and $244 per month in 2021. In fact, L.A. County will increase its Options healthcare contribution by 1.5% in 2019, 2% in 2020 and 2.5% in 2021. Most importantly: We secured a guarantee of fully-paid, single-party, two-party and family medical coverage and dental coverage – no matter what happens to healthcare premium costs over the next three years. Question #8: Why did we accept a Flex Earnings cap? Answer #8: In order to protect our Options Plan. The California Appeals Court recently ruled in the Flores v. City of San Gabriel case that healthcare plans which include what was deemed as excessive Flex Earnings are not legitimate plans. Because of this ruling, the City of San Gabriel’s healthcare plan – which included Flex Earnings – was completely disqualified. Similar lawsuits have already been filed against the County of Los Angeles. So we negotiated a Flex Earnings cap to protect the Options healthcare plan. But to protect our members, we also secured a guarantee of fully-paid, single-party, two-party and family medical coverage and dental coverage – no matter what happens to healthcare premium costs over the next three years. Question #9: Will the Flex Earnings cap affect me? Answer #9: The effect of the Flex Earnings cap will depend on your benefits plan. The biggest change will be for those with family coverage and the smallest change will be for those with single-party coverage. But don’t fall for the rumors! Remember: Additional wage increases were won at the individual tables to help offset these impacts and more importantly, we secured a guarantee of fully-paid, single-party, two-party and family medical coverage and dental coverage – no matter what happens to healthcare premium costs over the next three years. Question #10: Are these contract terms final? Answer #10: No. These are Tentative Agreement (TA) contract bargaining terms. All L.A. County SEIU 721 members in good standing will have the opportunity to vote on this TA. We will announce TA voting details once bargaining is complete. Click here to make sure you are a member in good standing and eligible to vote on the upcoming TA. This is your contract. You will want to make sure your voice is heard! Question #11: When will I get specifics about my Bargaining Unit/Classification? Answer#11: Remember, bargaining is still happening. Official summaries of the Tentative Agreement (TA) by bargaining unit are being drafted and will be released as part of the voting process. Every member in good standing with SEIU 721 will have an opportunity to read the facts for themselves and then vote YES or NO to ratify a contract. Click here to make sure you are a member in good standing and eligible to vote on the upcoming TA. Text SEIU to 31996 for the latest info. Excellent! Thanks for the clarity. Sorry my friend that’s the law of the land. They have to cap it in order to meet the requirements of a bonafide benefit plan under Flores v. City of San Gabriel. They may not “have” to cap Flex Benefit pay at all. Based on some research regarding Flores v City of San Gabriel, the Flex payout in this case was not considered incidental, (42-47% of the Flex Benefit payout was cash in lieu of benefits). If LA County’s Flex Benefit payout is considered incidental (allowed in bona fide benefit plans), then the County may not have to cap Flex Benefits at all. I will be losing money because of the capped out flex earnings. Even with salary increases they will eventually take flex away. The county is only getting worse. I’m gonna vote no on this contract. It’s not good. No wonder people dont wanna pay for the union anymore. Flex matters a lot on lower paid employees. the cap is only for certain bargining unit this don’t apply to clercial that what their not telling people in hopes that we’ll say no to the contract, it’s for the higher paid county employees..
Everyone? And is SEIU still negotiating with the Courts? Flex is capped. I’m losing money ! does this apply to child support officers? The schedule above shows 11.25%. Is it 11.25% or 10.75%? 1. The half step is for those employees who by 2021 have maxed out their salary and therefore are in their last step? or in 2021 everyone regardless what step they are in will get the additional half step? 2. For the flex earnings if someone previously had $450 left over after choosing their cafeteria benefits on a monthly basis but now that amount will be capped at $224 in 2021? 3. It would be nice if someone listed the classification who are getting a higher raise or what bargaining units are still in negotiations. Why does the union always accept an increase in parts? For example, a 7% increase is broken into the three years instead of fighting for the full 7% increase to begin on the day the increase begins? In effect workers receive the full increase only the last year. We are constantly losing money when it is broken up like this. This to me seems that the union is only fighting for cost of living increases. They do it to save money. Bonuses lot of reasons. Go on strike. We are losing money but dumb people happy when they say 1000 bonus. The numbers add up to 11.25% and not the stated 10.75%…is this a typo? Keep in mind; a 2% raise for an Employee earning a $45,000 salary equates to a $900 annual raise. Cutting just $100 from flex or other benefits equates to a $1,200 annual reduction from previous benefit payouts received. This is far from adjusting actual Salary & Employee Benefit payouts to keep up with 3-4+% cost of living in Los Angeles County. This is just a hypothetical example. Will we still have a co pay for healthcare? Will we get better eye care plans? I don’t believe that will apply to megaflex positions. I could be wrong but since our positions are not represented by the union it will not apply to whose who are megaflex. If someone knows different please let us know. Is there anyone that knows that answer to Justin’s question? Megaflex employees probably won’t know anything for sure until an official memo is sent out. As a Megaflex employee and we usually get exactly what union members get. I’m sure the flex cap will also apply to us. I am one of those who it wont affect as my flex earnings have never been more than $200. But that $1000 bonus will come in handy and salary increase I’ll welcome. Before county I worked at non profit, TRUST me these benefits would never happen at non profits! After some more thorough research, the flex cap probably won’t apply to us. Only to Options. Even if it does, we’ll be looking at some major overhaul to our plan since we don’t receive any vacation time. It will apply to non-exempt Megaflex employees. Megaflex employees aren’t represented in these negotiations. Megaflex employees receive the general salary increase and whatever the percentage is for benefits. The general salary increase I understand. What about the flex cap? Or the $1000 bonus? So many questions! Megaflex employees won’t get the 1000 bonus as that’s only for 721 represented employees. Megaflex employees will receive the standard contribution percentage increase. Unless you are a mega flex member who is represented and still at the table. How do we find out which are the lower paid members? When will the contract ratification happen? We will be taxed on the $1000 bonus? So we are actually getting like $500? QUESTION = WHAT WILL THE COUNTY DO WITH ALL THE MONEY THEY WILL BE SAVING ON THE FLEX EARN REDUCTION? IT SEEMS AT THE END OF THE DAY THEY ARE WINNING!!. IT JUST NOT FAIR I HAVE COWORKERS THAT HAVE BEEN WORKING FOR 35 YEARS AND WE MAKE THE SAME AMOUNT OF MONEY!!…. $1000 BONUS IS JUST AN OFFSET NOW FOR THE FLEX EARN WE WILL BE LOSING…. AND AS FOR THE LOWEST PAID MEMBERS …WHY ARE THEY ANY IN THAT LEVEL?…. It normally takes a few weeks for all the votes to be collected and then it has to go back to the board before it can be finalized. My advice (and I tell people this every time we renegotiate) don’t expect for it to happen within the first month or so. Stop complaining and move on! If you do not like working for the county, go somewhere else. The county will go broke if we have irresponsible spending. We get wonderful benefits that nobody else gets. If you don’t make enough, then maybe go back to school or do something else. You cannot expect to make a lot of money if your occupation does not deserve it. No. the free market determines what occupation gets what. Highly skilled brain surgeon gets more than a EMT. You can be a freelance yoga practitioner your entire life because you love it. But don’t expect the pay of a electrician while he works and all you do is chant ommmmmm. Everyone makes their own decisions, sacrifices, and outcomes based on weighing many factors. If you love your low-paying job, you have to be content that your love doesn’t pay well. The county almost went bankrupt and the presidentof the UnitedStates had to bail us out. Interesting how the republican supervisors gave us a better contract 3 years ago than the new so called labor friendly progressives. Why cant we receive 3% on Oct 1, 2018 and when October 1, 2020 receive 2.5 % and then receive the 2.75% in January 2021. I hate when we reach TA they give us kibbles and bits especially when we had to wait almost a year later to get the rest. It is very annoying to receive 1% gas money. That’s only 8.25% total. I’ll take the 10.75% instead. Is it true that flex earnings needs to be used in purchasing life insurance, and if you don’t use it that way you loose it? No. While most people do use that money to purchase life insurance it is not a this for that thing. If you decide not to purchase life insurance with your flex earnings they just put the difference in your check. Are you considering this contract with your reply? If certain flex benefits are capped, you may lose some of your flex benefit payout if you do not use them to purchase enough benefits. This is a increase for union fees not for employees. With a flex pay cap I’m not getting a raise only union getting a raise on their fees. I completely agree because these comments are ridiculous. The same people complaining are the ones that probably didn’t even vote when asked to create his or her bargaining team and didn’t even bother to send in what they would like for the team to fight for. You are the perfect person to get involved in the bargaining process. You will see it is much more than the Your Union and Your Bargaining teams, who represents you, to reach contracts. The bargaining for the next contract will begin shortly after the vote is ratified. I hope to see you there! This comments post have been infiltrated by anti-labor union entities. Join the discussion…Looks more like individuals upset with the ineptitude of the union imo. They have far too long been comfortable knowing that their income was guaranteed by corrupt politicians giving them exclusive representation/ bargaining rights. The very same politicians that they continue to support and tell you to vote for. Now, post Janus, they need to step up their game and start actually representing us, or get left behind. Your entire comment should be on a t shirt to wear at these union meetings! The contract is no good if they take away the Flex pay or even cap it out. Plus everyone get the benefits even if they do not contribute to the union. That is not fair. This contact will just be break even or event cost us money after 3 years due to inflation cost increasing by 4% every year. We need at-least 5% – 6% raise each year at-least to compensate the Flex pay lose. What am I paying union fees for? We should cap our union contribution as well. The “additional wage increases” do not “help offset these impacts.” On the contrary, we will get a smaller percentage than the 10.75% if we count everything that we are losing. The other 56000 were at work earning a salary not AWOPing. Good point.^^ Why does the County allow 2 hours to vote but can’t give time for this? And they give you the entire day to be a pollworker, but no time for this? Just noticing the double standard. How was the communication conveyed to go on the march on October 2nd? Was there a mass email sent out? I would like to add that department management needs to support letting go there staff to go on this march. In my experience in the years with the county, the Departments don’t encourage. Some even grown if you take off. I find it funny they encourage staff to sign up for the November polls, even giving extra compensation of $200 to sign up as a pollworker. But something important like this is not pushed. Thank you, Pearl. Stay strong, don’t mind the anti-union operatives here. What does Flores v. City of San Gabriel have to do with a flex earnings cap? That lawsuit was brought because flex earnings weren’t included in the premium overtime calculation even though it was included as employee wages and taxed. What is the lawsuit currently brought against LA County regarding Flex Earnings? It matters because there is a similar lawsuit against Los Angeles County for the same thing. Log into the mylacounty site and you’ll see that we were given the difference from any overtime to include flex earnings. Contrary to what people believe, all that money the county has to pay out will effects the workers down the line. I honestly don’t know all the details about the lawsuits. Once the lawsuit documents are available I’m a do my own research and find out exactly what happened. To add to your point about a Clerk’s salary back in 2005. Keep in mind that the State of California, in 2016, signed a bill to raise the minimum wage to $15 by 2022. In that sense, many large CA Employers have not choice but to raise the minimum wage. Also, it is yet to be seen if this TA is a gain to add to the books as you day… Although it very well could be, once the details are released, actual calculations will show the outcome for better or for worse. Thank you for fighting for us and negotiating for the best options! Also thanks for updating the system to minimize confusion and rumors. Weird that you don’t have anything to say about the “inequity” between the ISA and NSA series at the 2 level, where NSA outclasses both the Application Developer II and Information Systems Analyst II roles. I guess it only matters when it’s you? I’m gonna get the 1000 bonus then quit and go to kaiser. I will start at almost 10 dollars more an hour. The county is only getting worse. Its either dumb new employees who dont know better or old people defending why they stayed at a job they didnt like while being underpaid. who is the half step for? is it for employees that have maxed out their salary and therefore are in their last step? or in 2021 everyone regardless what step they are in will get the additional half step? It’s my understanding that you will get the half step once you max out (last step) on your item. Eventually, you will get it if you aren’t maxed out yet. I don’t believe there is any confusion about what you have stated. I think you are right in the sense that the Salary Increase and One-time Bonus are going to offset the Flex reduction. That is why some or many are dissatisfied. Because; that One-time Bonus and Salary Increase will not nearly offset the Flex reduction AND cost of living. So, it could be said that the Union did a great job in offsetting the reduction in Flex earnings, but maybe not so much on the Cost of Living side…. Does $325 cap begin Jan. 1 2019 or Jan. 1, 2020? Does $244 cap begin on Jan. 1, 2020 or Jan. 1, 2021? are there any updates after 10/02? did the union discuss anything further with the board of supervisors on this day? are there any new updates, since the board of supervisor meeting on 10/02/2018? I have a question about the 1.5 extra pay to low pay employees. Does this also include Secretarial positions too or not? Can someone explain if the CAP on flex earning will affect Mega Flex non exempt employees? No it won’t. It will only affect the Options Plan. MegaFlex is a different category entirely. Just like how the $1000 bonus does not affect us, neither will the cap. We will only receive the general salary increases. No I think they are getting less because they are already overpaid. If you are a county employee you should get the increase. Also I think the nurses have a separate thing going on with their BU. Some nurse’s are underpaid, for the education/training they have had to go through and what they do on a daily basis. is it true only certain employees are getting the 10.75% raise and the $1,000 bonus?